McLEAN, Va., Aug. 14, 2018 /PRNewswire/ -- Capital One Financial Corporation (NYSE: COF) today introduced the newest Savor card, which now makes it easier to earn rewards for memorable meals and the unique experiences you're already having with friends and family. Customers can now earn an unlimited 4% cash back on dining and entertainment purchases. In addition to those rewards, customers will earn 2% at grocery stores and 1% on all other purchases. Savor also offers Capital One cardholder benefits like exclusive access and exciting perks to curated experiences and ticket presale opportunities across dining, entertainment, and sports. New cardholders will receive a $500 bonus after spending $3,000 on purchases within the first three months of opening the account. "Capital One is introducing the new Savor card, with unlimited 4% cash back on dining and entertainment, which now makes it the ultimate card for dining out and going out. We know it's important to our customers to enjoy memorable meals and moments with family and friends, so we aimed to make an already great product more rewarding," said Lauren Liss, vice president of U.S. card at Capital One. "Savor rewards you when you're enjoying a favorite meal at a local restaurant or takeout at home. And whether you're heading to a concert with friends, or the movies with your kids, the new Savor card helps make these experiences more rewarding with 4% cash back on dining and entertainment." Capital One created the new Savor card because customers enjoy experiences across dining, sports, comedy, and a variety of events that create lasting memories with family and friends. Because of this, with the new Savor card, customers can earn 4% cash back on dining, including, but not limited to, purchases at restaurants, fast-food places, coffee shops, and bars, and entertainment purchases, including live performances, sporting events, amusement parks, movie theaters, and more. Like all Capital One cards, the new Savor card has no minimums for cash back reward redemption, no rotating categories, no category caps, no foreign transaction fees, and comes with the same great digital features as other Capital One products. 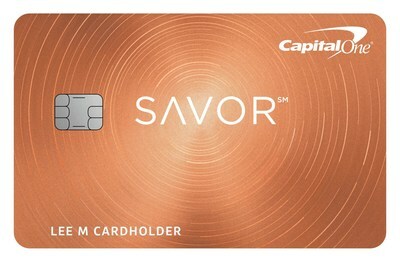 For more information about the new Savor card from Capital One, visit: www.capitalone.com/credit-cards/savor-dining-rewards/. Capital One Financial Corporation (www.capitalone.com) is a financial holding company whose subsidiaries, which include Capital One, N.A., and Capital One Bank (USA), N.A., had $248.2 billion in deposits and $364.0 billion in total assets as of June 30, 2018. Headquartered in McLean, Virginia, Capital One offers a broad spectrum of financial products and services to consumers, small businesses, and commercial clients through a variety of channels. Capital One, N.A. has branches located primarily in New York, Louisiana, Texas, Maryland, Virginia, New Jersey, and the District of Columbia. A Fortune 500 company, Capital One trades on the New York Stock Exchange under the symbol "COF" and is included in the S&P 100 index.